In a paper published online March 13 in The Wilson Journal of Ornithology, a research team led by University of Washington biology professor Dee Boersma reports that fully grown Galapagos penguins who have fledged—or left the nest—continue to beg their parents for food. And sometimes, probably when the bounty of the sea is plentiful, parents oblige and feed their adult offspring. "Through field seasons over the years when we were observing penguin behavior in the Galapagos Islands, we saw these isolated instances of adults feeding individuals who had obviously fledged and left the nest," said Boersma. 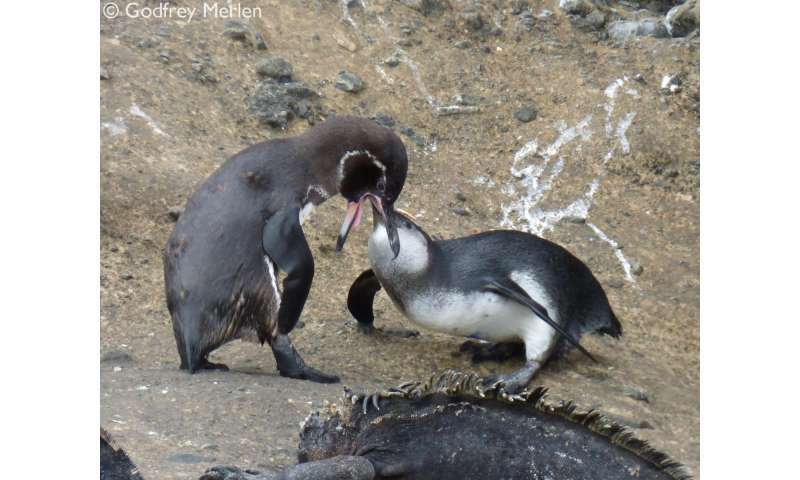 "And now we've collected enough field observations to say that post-fledging parental care is a normal—though probably rare—part of Galapagos penguin behavior." In many seabird species, parents continue to feed their offspring after fledging, at least for a limited period of time. But this is not true for the world's 18 penguin species. Galapagos penguins are now only the second penguin species—after Gentoo penguins—to demonstrate post-fledging parental care. And Boersma does not expect to find more. This behavior in Galapagos penguins, a species she has studied for more than four decades, may be an adaptation to the constantly fluctuating availability of food in the archipelago they call home. 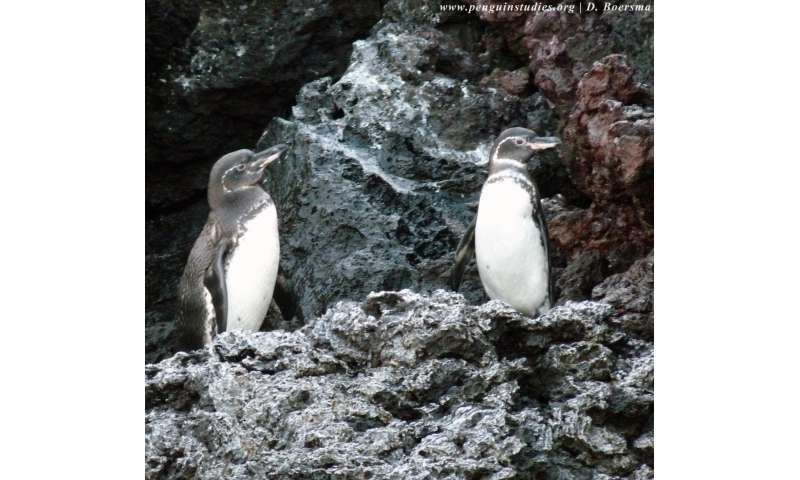 Boersma's team observed five instances of post-fledging parental care during detailed field observations of wild Galapagos penguins from February 2006 to July 2015. Newly fledged adults—called fledglings—are about 60 days old and sport a distinct appearance due to their lightly colored feet and cheeks, as well as a relatively new and spotless coat of adult plumage. The researchers saw fledglings on the beach beg for food—using distinctive vocalizations—as adults emerged from the water after feeding. Some adults, presumably unrelated to the fledgling, would peck at the fledgling or move away. But the scientists also witnessed scenes in which a fledgling approached an adult, begged and received regurgitated food from the compliant adult. In most penguin species, including the Galapagos, parents and offspring recognize each other using a variety of cues such as vocalizations and location. Based on the juveniles' begging behavior, Boersma believes that adults who fed a fledgling were likely its parents. 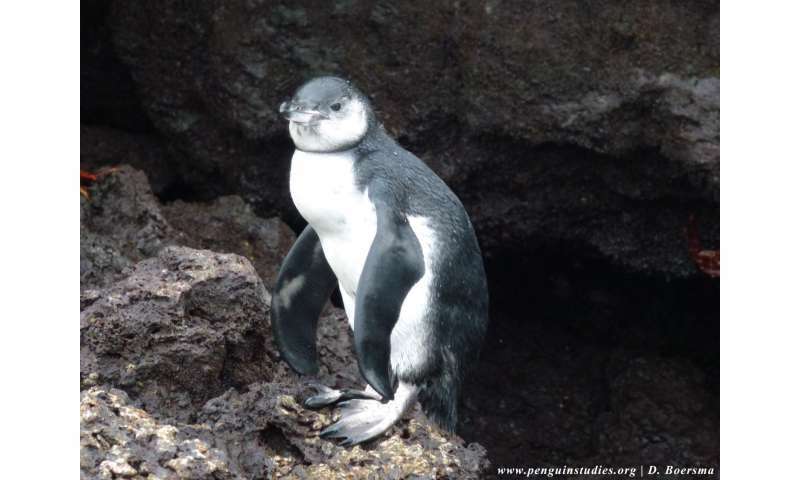 Fledgling care is only one of several behaviors that distinguish Galapagos penguins from other penguins. Many of these peculiarities make sense when considering where they live, Boersma said. Volcanic in origin, the Galapagos Islands straddle the equator. Thus, Galapagos penguins must cope with extremes such as punishing heat on dry land and relatively cool ocean waters. The islands are made up of rough igneous rocks, and their oceanic food supply can swing between bounty and famine depending on climate patterns in the wider Pacific basin. "When climate patterns are ideal, ocean currents bring plenty of fish to the Galapagos for the penguins," said Boersma. "But when you get a strong El Nino, the adults struggle to feed themselves and meet the energy demands of their own bodies." 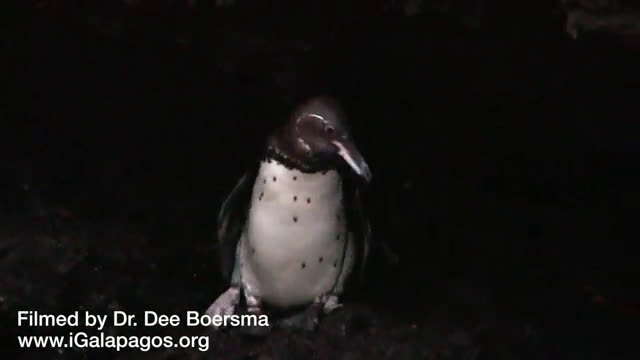 As a result, Galapagos penguins adjust their behavior based on food availability, Boersma said. They prioritize molting, the energy-intensive process of shedding their old coat of feathers and replacing it with a new one. All other penguin species molt just once a year, while Galapagos penguins molt twice a year, getting rid of worn, sun-bleached, algae-covered feathers. Most other penguin species breed before molting. But only after molting do Galapagos penguins breed, and they can skip a breeding window entirely or abandon their chicks if food is scarce. "Galapagos penguins have adapted themselves not to the seasons, but to the whims of the bounty of the ocean," said Boersma. To Boersma, post-fledging parental care among Galapagos penguins makes sense when viewed through this lens. Parents may feed fledglings for a few weeks while the youngsters learn to hunt effectively, she said. Many seabirds rely on vision to hunt like penguins, and many seabird parents care for fledglings while they practice. Both Galapagos and Gentoo penguin parents have been observed sticking close to their nesting site after the chick fledges so they can feed their fledged offspring. In other penguin species, many adults molt shortly after the young fledge and many migrate from their nesting area, which is why Boersma believes that few other penguin parents care for their fledglings after they leave the nest. Galapagos penguins may simply have evolved this behavior to increase their reproductive success and make the most of the bountiful times. Boersma and her team were reminded of this last month, when they were in the Galapagos Islands once again for field studies. "In February 2017 when we were in the Galapagos, fully 40 percent of the penguins we counted were juveniles who fledged within the last few months," said Boersma. "That would indicate that food is plentiful and this was a good time to breed. But in the Galapagos, especially with climate change, the good times can vanish in an instant."